The Manual Boost Controller (MBC) that I send comes with the extra vacuum line attached in a loop. There should be plenty of hose for most installations. The intake and charged air hoses should be removed from your car to access the area that you will be installing the MBC. 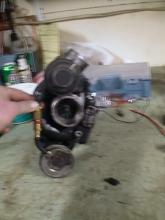 Locate the Waste gate on your Turbo, arrowed in the following picture, though your turbo may vary. 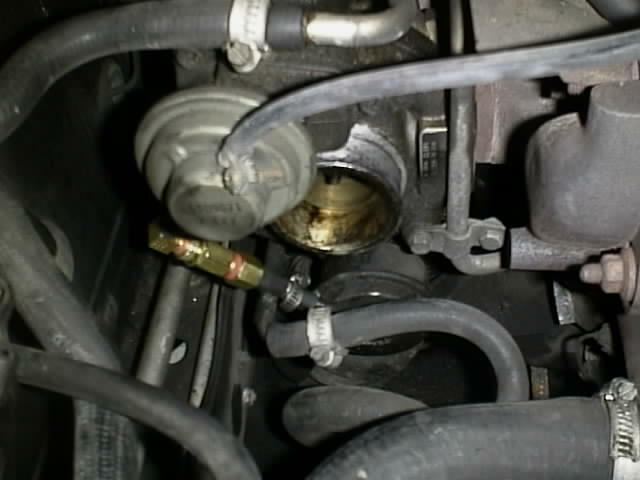 Remove the hose from the waste gate that leads to the charged air side of the Turbo. Carefully measure the needed length of hose to go from the waste gate to the pressure lead. Cut the loop of hose so that the threaded end of the MBC is AWAY from the waste gate, see the following picture for reference. Once the hose has been cut, lengthen the MBC as long as it will go by turning the threaded portion counter clock-wise. BE CARE AT THIS POINT...THERE IS A SPRING AND BALL BEARING THAT CAN COME OUT. Once the MBC is set at the LIGHTEST setting install it onto the Turbo, once again, be sure that the threaded portion is AWAY from the waste gate. Tighten the lock nut and reassemble the hoses on the car. Take the car for a short spin and observe the boost gauge and take note of the boost levels. The setting processes is long and tedious but be sure to take your time and find the setting that works best for your car. As the controller's length is shortened the boost pressure will increase. The following picture will show you how that relationship works. I have these Valves complete and ready to purchase if you don't want to build them yourself. Please E-mail me at dan@volvospeedshop.com and we can get the MBC on it's way to you. They are only $20 plus $5 for S&H.